The new wave of computer-driven entertainment technology throws audiences and game players into massive virtual worlds where entire cities are rendered in real time. Computer animated characters run through inner-city streets teeming with pedestrians, all fully rendered with 3D graphics, animations, particle effects and linked to 3D sound effects to produce more realistic and immersive computer-hosted entertainment experiences than ever before. Computing all of this detail at once is enormously computationally expensive, and game designers as a rule, have sacrificed the behavioural realism in favour of better graphics. 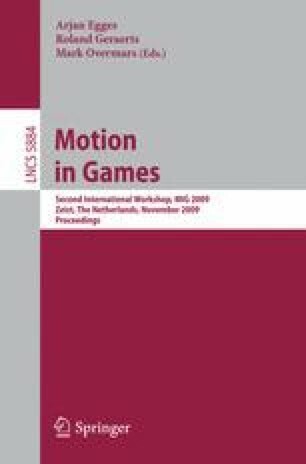 In this paper we propose a new Collision Avoidance Level of Detail (CA-LOD) algorithm that allows games to support huge crowds in real time with the appearance of more intelligent behaviour. We propose two collision avoidance models used for two different CA-LODs: a fuzzy steering focusing on the performances, and a geometric steering to obtain the best realism. Mixing these approaches allows to obtain thousands of autonomous characters in real time, resulting in a scalable but still controllable crowd.